Where would we be without a good idiom or two? We all know, it takes two to tango, and you can’t always judge a book by it’s cover; a penny for your thoughts on that one, might just be a blessing in disguise, unless, of course, you think I’m barking up the wrong tree. Dogs get a bad rap in the idiom department. I mean, when a dog barks up a tree, he’s got a good reason, there’s no mistake about it. And, let sleeping dogs lie? My pooch never cared if I gave him a stroke or two when he was sleeping. As for a dog’s life, well, let’s not beat around the bush, it’s a piece of cake. At least mine was. Sadly, I’m talking in the past tense about Jeter, my beautiful beagle, because we had to help him out of a jam this past week. Cancer had stolen his thunder. Last Saturday, out of the blue, Jeter couldn’t get out of bed. And when he finally did get up, somewhere around the noon hour, he wanted nothing to do with food. This is a beagle we’re talking about, food was his life. We called the vet’s office, they were closed. He was definitely off his game, but he perked up a bit, so we figured an appointment first thing Monday morning was in order. By Sunday morning, the game had changed; it was an emergency, he was in bad shape. Beyond hearing it straight from the horse’s mouth, a picture painted a thousand words, the x-ray showed a massive tumor on his spleen. It was advanced. His organs had been crushed to one side; decisions needed to be made. In the heat of the moment, BK and I didn’t see eye to eye. I felt his suffering, but he wanted him to have more time. (Or maybe that time was for us, in any case, thank goodness he won.) The doc worked a little magic; helped him with some borrowed time. Jeter would get one more trip to Brooklyn to see the kids. He was back in the drivers seat, at least for a few days. Shay even flew up from Miami to say goodbye. He went out in grand fashion. To make a long, idiom-filled story short, Elvis has left the building. All drollness aside, it’s been a heartbreaking week. 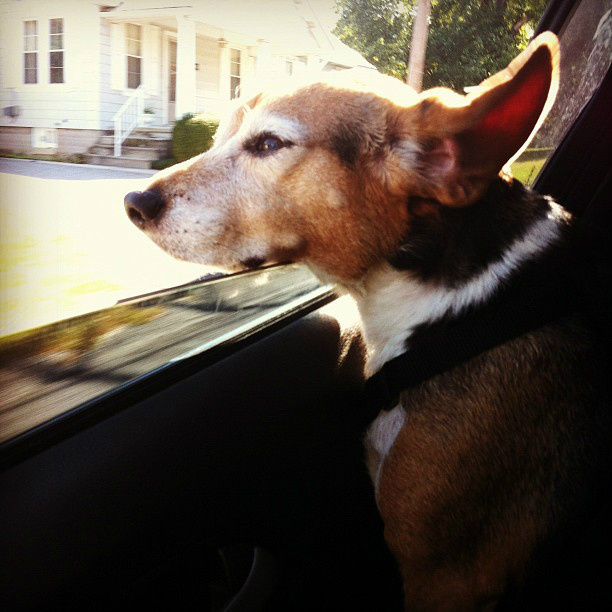 Jeter was the coolest dog, couldn’t have asked for a better companion. After BK started travelling for his job, the empty nest would have been my undoing without my beagle buddy. He was always with me, right by my side; guarding the lady of the house. My great defender had experience too, for years, while we were all at work and school, he kept my Mom company. She always said he was her saving grace. His only downfall was food. He could never get enough. Can’t tell you how many pieces of pizza, cookies and the occasional bowl of cereal got pilfered. His lightening speed was never more on point than when he was stealing food. He was legendary, even had a rep in the hood. We were the first people to move into our neighborhood; it was a construction site for years. With new construction, comes workman; with workman, comes lunch breaks. He would regularly scour the empty basements for McDonalds bags, had a beacon for errant French fries. I’ll never forget the day we visited the builder and a couple workman getting ready to settle down to a much-deserved lunch break. The house next door was being built and I had taken Jeets out for a pee break. We walked over to talk to them just as they were pulling out brown bags. No sooner had one of the men set his sandwich on a small wood trailer than Jeter jumped up with the speed of Superman, grabbed the bologna masterpiece, and took off. Houdini would have been proud, now you see it, now you don't. I was embarrassed, the workman was pissed, and the other two were laughing hysterically. From that day forward he was know as, The Little Thief. Not exactly the rep we were hoping for, but I’ll give him this, at least he made amends with a Chick-fil-A gift card. When it came to getting food, Jeter was a genius, down to figuring out how to open the refrigerator. He had a discerning palate, only the best for the Jeets. One night we came home to find a Chinese food container sitting up-right, in the middle of the family room floor; flaps up, licked clean. I always had a picture of him standing there perusing the fridge contents, tapping his lip until he landed on Chinese left-overs. Figured he lit a candle and tied a little napkin around his neck before he delicately opened the container and devoured the contents. There it stood, as if one of us had eaten it, not a rip or hole anywhere. We had to laugh. He always made us laugh. Until the end, he made us cry. Hearts broken beyond words. Deciding to put him down was one of the hardest things we’ve ever done. My Auntie K, who has a connection to animals like no other person I’ve ever know, told us he wanted to be let go; he was ready to soar. She was right. By the time we finally went back to the vet, he was bloated and bleeding internally. My sweet boy, who showered us with love every time we walked in the door, needed relief. It was time to say goodbye. We were so blessed to have Jeter in our lives. His was an unconditional love, constant and enriching. Medicine for the hardest of times. When we lost both Rory and Mom, he knew; he tended our shattered hearts. Bolstered a house of broken spirits. It’s what dogs do best, they love without expecting anything in return. It’s admirable. The idiom has it wrong, it’s not hard and unpleasant; it’s a dog’s life and it’s a gift.